As hot summer weather tapers off into cooler temperatures, it can be tempting to assume heavy pest pressure is also waning on your accounts. However, insects like ticks, multi-colored Asian lady beetles and cluster flies can still be active threats during the fall season — and even into the winter, in some cases. Thankfully, Demand® CS insecticide from Syngenta has you covered with a broad-spectrum label, unique formulation and proven pest control results. The longevity of Demand CS was proven in a trial conducted at Virginia Tech. 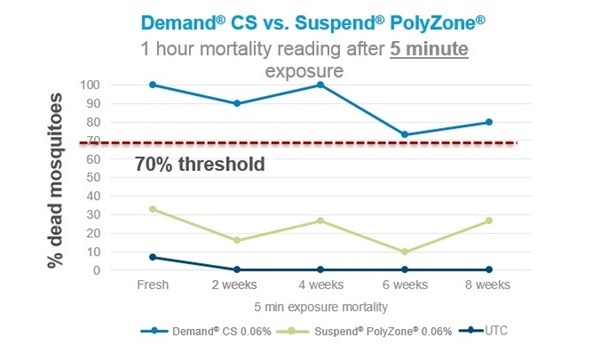 Mosquitoes were exposed to Demand CS and Suspend® PolyZone® insecticides for five minutes, and mortality was evaluated one hour after the five-minute exposure. After eight weeks, applications of Demand CS resulted in more dead mosquitoes above the 70 percent threshold than applications of Suspend PolyZone. Source: Sally Paulson, Ph.D., Virginia Tech, 2016. Performance assessments are based upon results or analysis of public information, field observations and/or internal Syngenta evaluations. Trials reflect treatment rates commonly recommended in the marketplace. To address the rise of tick-borne diseases across the U.S., the SecureChoice℠ Tick Assurance Program features Demand CS for guaranteed outdoor tick control on a 90-day treatment cycle. The program’s application recommendations have been thoroughly tested by technical experts for tick control results that can help you put your customers at ease. The mode of action in Demand CS also makes it ideal for controlling fall invaders, which can stain or produce foul odors inside customers’ homes. While other microcaps can quickly deteriorate from UV light or pH extremes, iCAP technology has dual-walled microcaps that protect the active ingredient from these harmful conditions. This enables extended residual activity to help control fall invaders throughout the winter. Don’t get complacent: choose Demand CS to stay ahead of fall pests and keep your customers cozy, carefree and pest-free. For more information, please visit www.SyngentaPMP.com/DemandCS. ©2018 Syngenta. Important: Always read and follow label instructions. Some products may not be registered for sale or use in all states or counties and/or may have state-specific use requirements. Please check with your local extension service to ensure registration and proper use. Demand®, For Life Uninterrupted™, iCAP™, SecureChoice℠ and the Syngenta logo are trademarks or service marks of a Syngenta Group Company. All other trademarks are property of their respective owners. Syngenta Customer Center: 1-866-SYNGENT(A) (796-4368).